1941. A German submarine, U-330, patrols the stormy inhospitable waters of the north Atlantic. It is commanded by Siegfried Lorenz, a maverick naval officer who does not believe in the war he is bound by duty and honour to fight. U-330 receives instructions to collect two prisoners from a vessel located off the Icelandic coast. A British submarine commander, Sutherland, and a Norwegian academic, Professor Bjørnar Grimstad, are taken on board. Contact between the prisoners and Lorenz is forbidden and it transpires that this secret mission has been ordered high up in the SS. It is rumoured that Grimstad is working on a terrifying weapon that could change the course of the war. A series of shocking, brutal events occur. In the aftermath, disturbing incidents start happening on the boat and it seems that a lethal, supernatural force is stalking the crew, wrestling with Lorenz for control. Three hundred feet under the dark, icy waves, it doesn’t matter how loud you scream . . . When most British people think about the battle of the Atlantic they think, not of British submarines, but German U-boats. The U-boat is a vessel that, like the Marie Celeste and the Titanic, has escaped its historical strait-jacket and achieved mythic status. At the beginning of WWII the U-boat threat was so significant, Churchill claimed that it was the only element of the Nazi war machine that really worried him. The fact that U-boats often hunted in ‘Wolf Packs’ certainly gave the Germans a psychological advantage: the idea of the ‘Sea wolf’ resonates with primal fears of predation. Moreover, many U-boat commanders were mavericks who seemed to radiate the kind of romantic aura usually associated with fictional figures such as The Flying Dutchman. They listened to Jazz, even though it was forbidden by the Nazi party, and had a well-earned reputation for bravery and irreverence. The mythic status of the U-boat is solidly underpinned by sustained and widespread general interest. There are numerous web sites dedicated to U-boats on which enthusiasts discuss and debate obscure technicalities in minute detail. The military shelves in book shops usually stock at least one book on the battle of the Atlantic and U-boats have been intermittently surfacing in Hollywood for over half a century (the US box office hit ‘U-571’ is a notable example). Public interest in U-boats is sufficiently high to justify the existence of several U-boat museums in the USA and Europe – some of them in unexpected locations. For example, U-534 has been turned into an exhibition space in Birkenhead near Liverpool. The primal fear aroused by the wolf pack still has the power to distort perception. The myth of the U-boat continues to exert disproportionate cultural influence. In reality, the U-boat threat was proficiently dealt with by the Royal Navy and Royal Air Force. And once America had joined the war Admiral Dönitz and his sea wolves were pretty much doomed. Most U-boat missions became suicide missions and the fleet was utterly obliterated. By the end of the war, twenty-eight thousand of the thirty-nine thousand men in the German U-boat force were killed (either burned to death, suffocated, drowned, or most likely, crushed to death as they sank below the pressure tolerance of the boat). Adolf Hitler, a former infantryman, always favoured the army over the navy, and U-boats were never given the air support they needed. 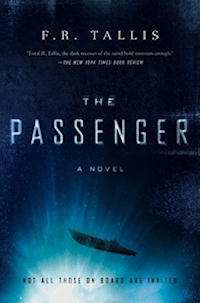 The Passenger, is about a haunted U-boat. It was inspired by the writings of the naval historian George Minto, who documented a series of extraordinary occurrences on U-65 – a WWI submarine. The German admiralty was minded to employ a Lutheran pastor to conduct an exorcism, which must have been ineffective, because U-65 eventually sank in mysterious circumstances. A submarine is the most remote of haunted houses, a fragile habitation situated in the midst of a vast, inhospitable wilderness. Classic writers of supernatural fiction, particularly H.P. Lovecraft and William Hope Hodgson understood very well the chilling possibilities of casting humanity adrift on dark water. It isn’t at all clear why the U-boat has retained its mythical potency. The Germans lost the battle of the Atlantic, but accomplished a decisive, narrative victory. The U-boat continues to glide through the western psyche, its majestic passage unobstructed by minor inconveniences such as fact or historical truth.